Toronto – One of the few examples of effective global action against climate change is the Montreal Protocol, a 1987 agreement designed to limit the use of ozone-depleting chlorofluorocarbon gases. The protocol achieved universal ratification in 2009, making it one of the rare international environmental agreements to be adopted by every member nation of the United Nations. 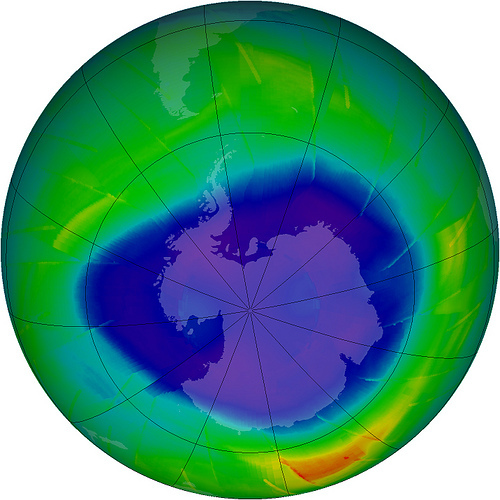 But the agreement was more than just a diplomatic coup — the Montreal Protocol had an immediate and measurable impact on the preservation of the ozone layer, the depletion of which became a major international concern after a “hole” was discovered over Antarctica in 1985, a mere two years before the protocol was signed. What in the 1980s had seemed like an insoluble environmental disaster eventually came to be seen as an example of a crisis averted following the signing of the protocol, as worries about the ozone layer dissipated alongside the widespread use of CFCs around the world. But such confidence was perhaps premature. In a recently released report, scientists have identified four new man-made gases that appear to be contributing to the further depletion of the ozone layer. Three of the four are CFCs, though it is not yet clear whether they represent a violation of the Montreal Protocol or a loophole within it. Researchers found the gases by studying air and snow pack samples in Greenland and Tasmania. That a 27-year-old agreement — landmark achievement though it may be — should have a few exploitable loopholes shouldn’t come as a huge surprise, and it’s probably good for climate change activists to be reminded never to rest upon their laurels. But for anyone who looked to the international consensus on ozone depletion as an inspirational, if rare, victory for international cooperation on climate change, concerns over the ozone layer can be dispiriting.